Home / Where do we dive ? Protected since 1995, the Marine Reserve of Hormigas Islands in Cabo de Palos is a paradise for diving and an example of conservation and biological diversity. The best diving destination in Spain. Declared the best destination in Europe in 2016 and 2018 by various magazines in the sector and described as “a well-kept secret in the south east of Spain” according to the French magazine “Plonger”. National Geographics included it in 2016 in the Top 20 in the world (http://www.nationalgeographic.com.es/viajes/los-mejores-lugares-para-bucear_10011/1). The extension of the Sub Bética chain ending in Cabo de Palos forming underwater water mountains, posidonia meadows, walls of 40 meters with beautiful corals in which is easy to find huge groupers, barnacles (brothers of the barracuda of tropical waters), gilded, pollack, moray eels, tiny nudibranchs and a long etcetera of fish that, feeling safe, roam freely among the divers. Confluence of marine currents, those that come from the Atlantic and those that come from the interior of the Mediterranean, all of them converge in “the Marine Reserve of the Hormigas Islands“. To all this we add that a few miles ends the Continental platform creating an unparalleled space in the whole world, giving rise to the crossing of fantastic surprises such as moonfish, rorquals, sea eagles, dolphins and all the wonders that run through the Mediterranean Sea. 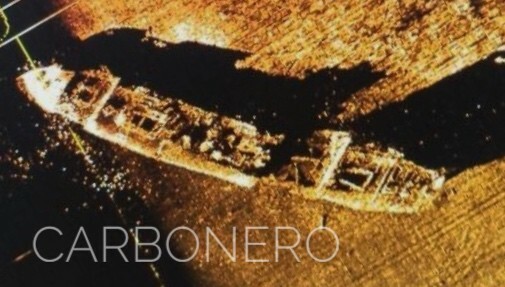 At different depths, lies a large number of sunken ships, such as the legendary transatlantic Sirius, the Carbonero or the wreck Naranjito, magical, mysterious and full of life. An authentic opportunity for technical and recreational divers. At the Hormigas Islands Diving Center, we want to accompany you, so you can enjoy all this, as we do every day. It is an easy and safe dive. Not being a very large bass, it can be covered in one or two dives, being the most interesting rock formation that is to the south. 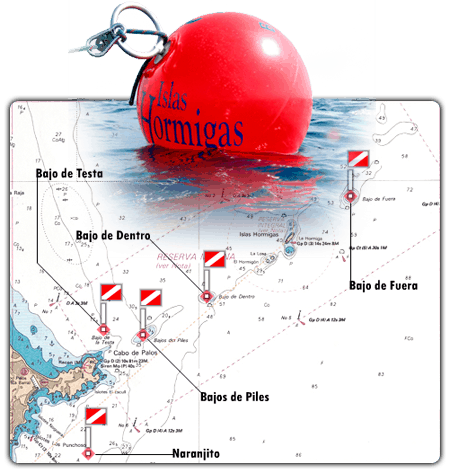 Despite being close to the coast, the reasonable for comfort and safety is to access a boat in which, leaving Cabo de Palos, and leaving the port itself for port, we will take course 0 º and so we will continue for 0.37 miles. It is a plateau-shaped rock formation, with a minimum depth of 8 meters and a maximum depth of 22 meters. On the west side, a slope joins the cape and the rest of the bass is surrounded by posidonia meadow with a beautiful rock formation to the south. We will find corvina, haddock, barracuda and royal bream. It is a rocky thorn about 75 meters long that extends to the East. Its most outstanding part is around seven meters although the average depth of the ridge varies between 12 and 15 meters. The deepest zone corresponds to the South face, where we find a bottom of sand of 27 meters that extends towards the lighthouse and towards the North, forming numerous rocky groups. The northwest face of the bass is formed by large blocks of rocks, it is very extensive and it can be easy to get lost and not find the return to the boat. Even though is not a very rich algae bass, it is striking the large number of morays that it harbors, along with scorpions, mojarras, false pollack and groupers both small and of good size, especially in the rock formation on the Northwest side. It is an excellent spot for a safe and calm dive of simple and medium level. The Bajo de Dentro is a rocky needle that emerges from a minimum depth of 3 meters. On its north side it has a platform of between 15 and 20 meters. On the east side of the bass we can find a cave of about 15 meters in 22 meters of water, inhabited by large conger eels. The life of the bass is home to a large number of marine species. It is common to see shoals of milts, barracudas, corvinas, sargos, morrajas, dentones, groupers, lobsters, moray eels and gorgonians. The dive in the Bajo de Fuera can be very simple if we enjoy the beauty of its bottom and the life it shelters, without exceeding 20 meters deep, always taking into account the indications of the guides about the currents that can be triggered in a very short time. If we want to reach the wrecks, as they are located at an important depth, it is important to have a good preparation of material and a good level of diving. The fauna that we are going to find are large shoals of milch, dentexes, barracudas, tuna that hunt on the way, turtles, sea bream, large groupers, moray eels, conger eels, sunfish, sea eagles, false pollack…. It is an extremely attractive low in terms of animal life because it is very far from the coast and its rugged orography, increased by the remains of ships that have been overlapping each other, with at least four hulls being perfectly distinguishable from as many wrecks, especially the mythical “Sirius”. We are working on this information, sorry for the inconvenience. Dive from boat, simple, fun and safe. Perfect for all levels. Rich in small life and posidonia meadows. Leaving by boat in search of Cabo de Palos. Ideal for both beginners and experienced divers. A safe, versatile dive with many options. Putting south route, beyond the Punchosos, we find an underwater plateau. Perfect for any level we can enjoy its unique orography. A fun route that will allow us to enjoy the most peculiar geological structures of the Cape coasts. Going out by boat we will be able to enjoy one of the most recommendable dives. Safe and suitable for all levels. El Naranjito or Isla de la Gomera (its real name) is a merchant ship that was sunk in the 1950s due to a landslide of its oranges, from where it gets its name. It is in vertical rest as if it were sailing towards Cabo de Palos. The dive is of considerable depth and unless we investigate the wreck we will have to make a significant decompression in open water and with the only reference of our instruments and the anchor chain, so it is very important to consider the air reserve necessary for the completion of the dive in safety. It is considered a high difficulty dive. A minimum Advanced degree and verifiable experience is required. It is a merchant steam cargo ship built in 1899 and sunk in the vicinity of Hormigas Islands on June 25, 1916, at 23:30 (although by that time, the official date of the shipwreck was June 26). One of the versions points out that the sinking was caused by a German U-Boot, as there was a permanent U35 in the area maintaining the blockade of supplies to the Allies. The state of conservation of the wreck today is quite good, keeping almost intact all its structure, except for the bridge area and part of the area of the chimneys, near the machines, which have disappeared. The maximum depth of 60 metres is reached under the stern, close to the propeller. The minimum depth, 48 meters, is on the deck. Technical certification is required to dive this wreck. The THORDISA, known as the CARBONERO, was reportedly torpedoed by a German submarine, the U 35, which wreaked havoc in our area on October 13, 1917 when it went to aid the Vapor ‘Doris’ which was attacked earlier. It rests in its natural position, between 36 and 47 m deep.